★ UPGRADED & REFORMED 2.0 DESIGN | FIXED MOUNTS WITH RUBBER STOPPERS: The new Fixed rubber footed clamps can be adjusted to your most comfortable position and fixed there so you can work at your desk without worrying about your foot hammock sliding or falling down. 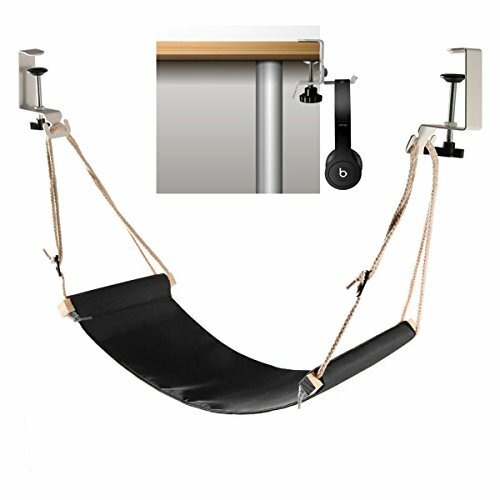 EFFECTIVE IN FUNCTION, COMFORTING IN FITTING: Your DESKOOL feet hammock can support upto 85 pounds of weight to suit people in all weight categories. IDEAL FOR: Square or rectangular desk with/without an apron. COMFORTABLE FEET EVERYWHERE:Your DESKOOL feet hammock has sold thousands of units worldwide and has the backing of a lot of happy and comfortable feet. Table should not contain cabinets or side walls.